Annex residents could be forgiven for thinking that creative, civic-minded developers are as rare as hen’s teeth. Long accustomed to property owners whose large and imposing concrete monstrosities loom over the area, they arrive at planning meetings prepared to fight. But what happens when the field of battle turns out to be a zone of conciliation? Such is the case with Westbank Corp. and its plans to redevelop Mirvish Village. 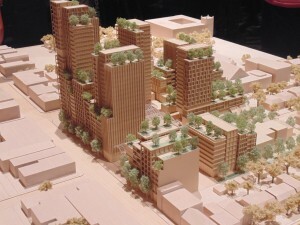 Shortly after a packed open house in early March, during which Westbank gave the community its first glance at the developer’s plans for the southwest corner of Bloor and Bathurst streets, residents are still trying to absorb the proposal, which is unlike anything they’ve ever seen. Forty to 50 interconnected buildings, the majority of which will be under 10 storeys, except for three at 29, 22, and 21 storeys, will house one thousand rental units, at least half of which will be two bedrooms or more. The buildings, which will appear to be separate when viewed from the outside, will also include live-work spaces, artist studios, and a daycare. There are plans for a covered public market, an alley with micro retail, bicycle valet parking, and auto share. And, 14 heritage buildings on Markham Street will be preserved. Although these initial concepts for the site have not been presented to the City, Westbank is canvassing the community for feedback on its ambitious plan. So far, the reviews are cautiously optimistic. “I don’t think I’ve seen a developer get so far ahead of a process and engage the community and city planners in a dialogue that was so authentic and ultimately had an impact on the development,” agreed the chair of the Bloor-Annex Business Improvement Area, Brian Burchell, who also publishes this newspaper. Among the things left out was consideration of how the area will absorb that much density. Other concerns raised included questions about the affordability of the units, the desire for greenspace, and the capacity of the nearby subway station. Then there’s the height of the tallest tower. “We’re trying to keep towers in the low twenties,” said Harrison, a comment echoed by Sue Dexter of the Harbord Village Residents’ Association. “Twenty-nine storeys is high. That’s density that you want to be concerned about.” She’s keen to get into the nitty-gritty of the project to understand “how it would work. We don’t know how each building relates to the other, who’s going to program Markham Street,” or what the buffer from the street would be for those living in the units. Still, Dexter views it as a positive step, even if there’s “lots of stuff to understand and there are concerns.